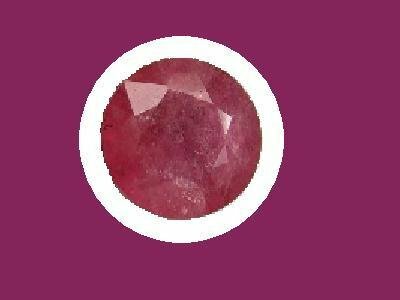 This is a Ruby loose gemstone in a dark plum red color. It is estimated to be 6 carats and 10mm in diameter and 5.5mm depth. It has natural inclusions seen by the natural eye and is clearness is included also. This gem is nicely facetted. Our gems are natural genuine and not lab created or cubic zirconia. This is a stock photo and may differ slightly than the photo shows. We try to be as specific as possible but all measurements are approximated. All gemstones may be combined with jewelry purchases for the discount shipping price. If you would like it shipped in a gemstone container, please purchase one in the gift box category. Please check out our Watch and Ware e-store home page by clicking or pasting this link: http://watchandware.ecrater.com and other Auctions at our eBays about ME page by clicking it or pasting this link into your browser: http://members.ebay.com/ws/eBayISAPI.dll?ViewUserPage&userid=watchandware2 . We offer low shipping costs and combine shipping. We charge only $2.00 shipping and handing for the item and $.50 s&h each after that per same shipment. For more details about our e-store and eBay policies and for our great deals on combining shipping costs, our return policy, international buyers payments and policies, and our non paying bidder policy please click or paste our about ME page by using the link above or click the terms link on the bottom of our e-store pages.